The Olmsted Falls City School District’s winter break began with the end of today’s classes – Friday, December 18th. Classes will resume Monday, January 4th. This is the final blog for the 2015 calendar year. Look for the next one appearing during the first week of school in January 2016. Happy Holidays and a very prosperous New Year to our students, staff, administration and community. Enjoy the break – and the warm weather. Olmsted Falls High School held its annual Local Scholarship Sponsor Appreciation Breakfast this month in the school’s Media Center. 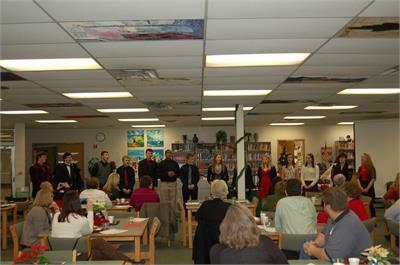 Highlights included a buffet breakfast and special holiday performance by the school’s Golden Expressions singing group. Last year, a total of 84 local sponsors provided nearly $119,655 through 228 scholarships for members of the Class of 2015. Our District extends its continued gratitude to all of these individuals, businesses and organizations for their generous support of our Bulldog graduates! The 2016 Local Scholarship Program is getting underway. For information on sponsoring a scholarship, please contact Mrs. Tommye Laut in the High School Counseling Office at 427-6116 before February 15, 2016. To view a photo gallery from this event, please click HERE. Four OFHS marketing students were selected as one of the top 10 teams for their innovative entry submitted for the Microsoft School Improvement App Challenge portion of the “World Series of Innovation” contest. The challenge was to design a fun and useful tablet or smart phone game or app for student use that is relevant to school or education. The students who submitted their Pi Smash entry are Grace Kelly, James Patton, Brett Hutkay and Jillian Mueller. Their entry made the finals for its originality, creativity and thoroughness. There were a total of 246 submissions in the challenge. This team of students will now create a short commercial video that promotes their innovation. The final three teams in each category will compete to win the People’s Choice award through online voting in late January and early February 2016. 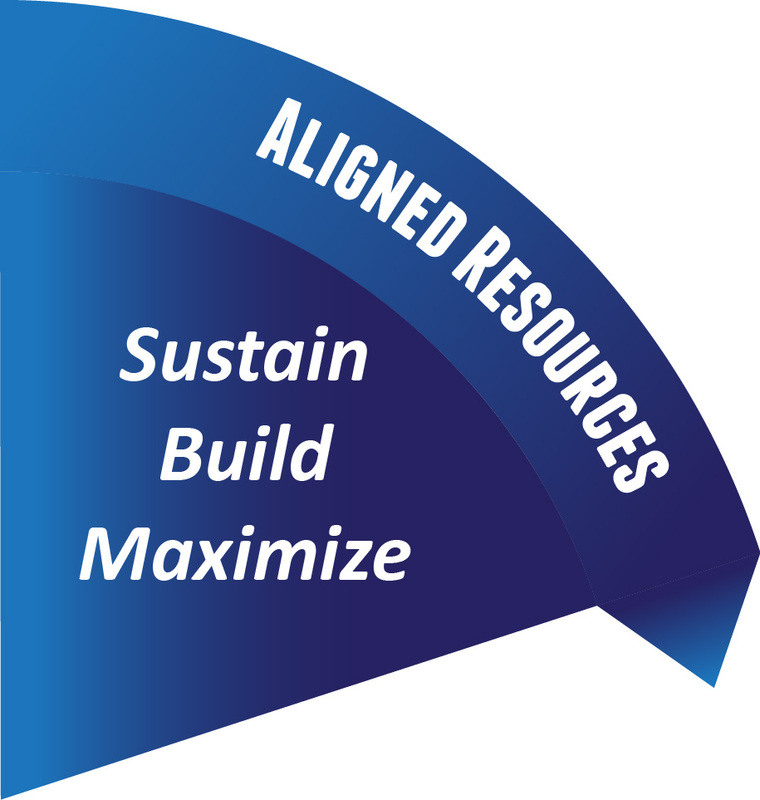 Watch for further details in upcoming blog posts. Congratulations to these students and good luck in the finals! 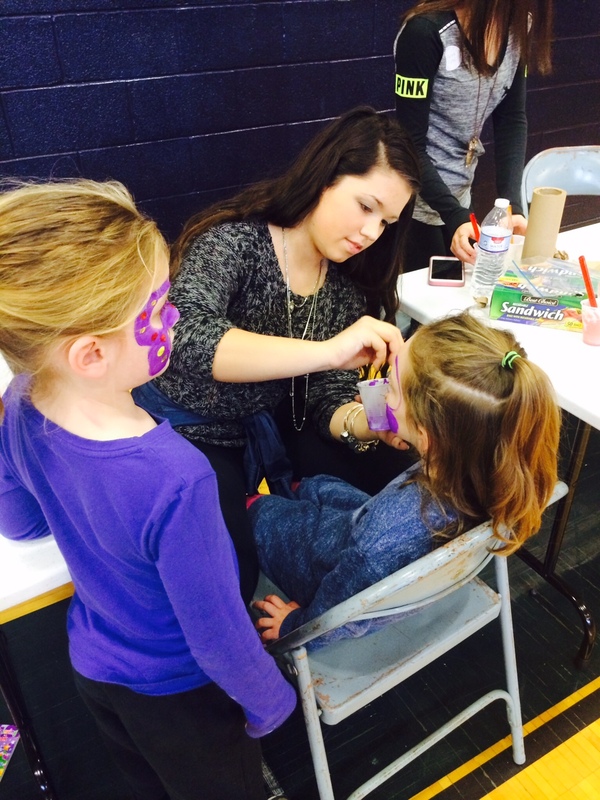 The OFHS Parenting and Child Development class partnered with the ECC preschool classes as field experience work. The high school students were to create a gross motor or fine motor activity for preschool children. The children had the opportunity to create snow globes, string beads on wire to make candy canes, participate in a golfing game, and work on their hand-eye coordination by hitting balloons with paddles and other activities. All had a great time! A big thank you to the ECC preschool staff for allowing these Bulldog students to have this interaction and gain valuable real world experience. 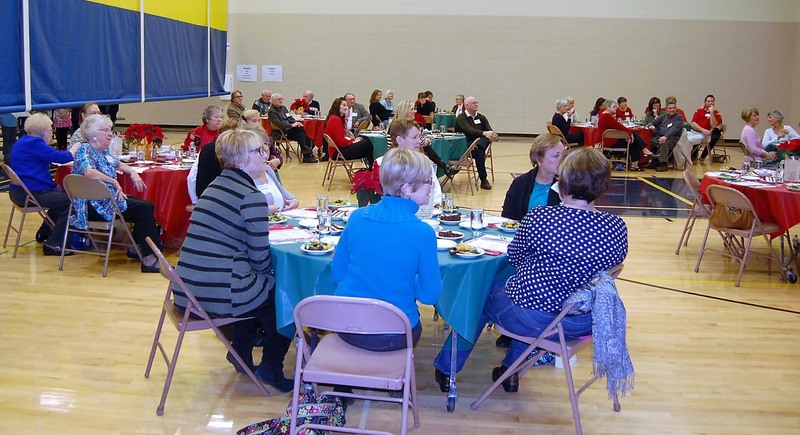 The Olmsted Falls Alumni Association hosted its annual holiday luncheon for retired bulldog staff members Tuesday at OFIS. Fifty-six retired Bulldogs attended this popular event, which the Olmsted Falls Board of Education sponsors to recognize the contributions and lasting impact of the District’s retirees. Retired staff members enjoyed a stuffed chicken breast lunch that Mrs. Denise Tabar and the outstanding food services department at OFIS prepared. Lunch was served by OFIS Student Ambassadors. 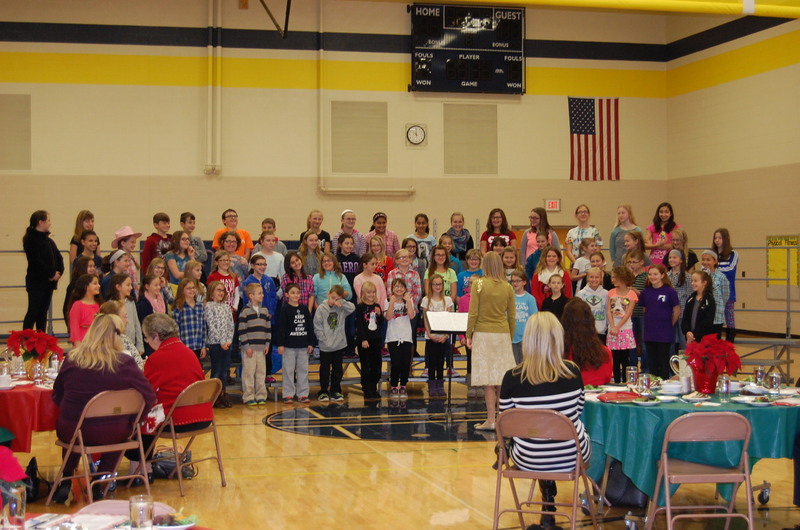 Guests were also treated to a selection of holiday songs by the Fifth Grade Chorus, directed by Mrs. Kelly McClellan. To commemorate the event, OFIS art teacher Mrs. Mariel Krakowiak’s students created beautiful Bulldog-themed tree ornaments for the guests to take home. Mr. Don Svec, Mr. Mark Tabar, OFIS student ambassadors and OFIS custodial staff created a hospitable environment for all the guests. To view additional photos from the event, please click HERE. Mrs. Brigid Radigan wrote a letter to Vitamix last school year asking the local company to donate reconditioned Vitamix blenders for use in her Nutrition and Wellness, Parenting and Child Development and Family and Personal Development classes. The company was very generous and donated six machines, which over the course of the year, will help teach 300 students and their families about the blenders, how easy they are to use and how they can be an integral part of a healthy lifestyle. 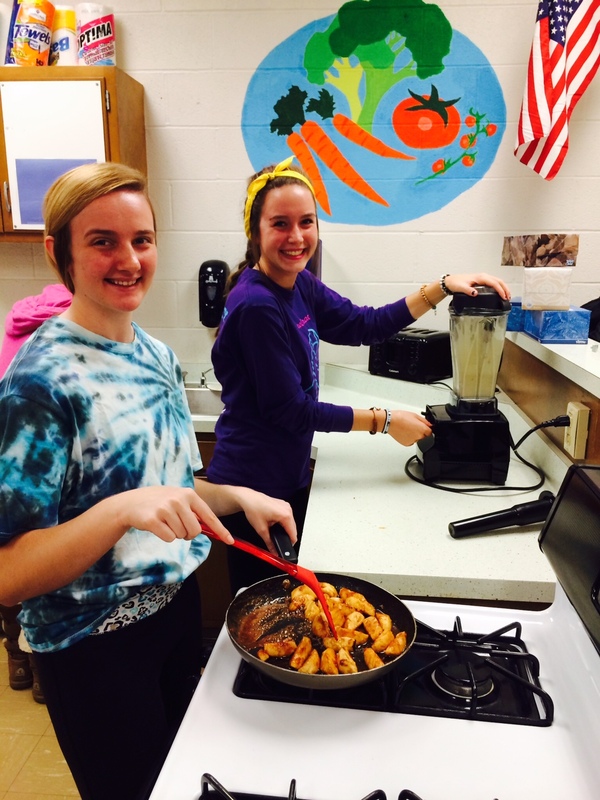 Photos shown here are students using the Vitamix blenders on their cooking lab days. We appreciate this healthy partnership Vitamix has with the district! Thank you Viamix! 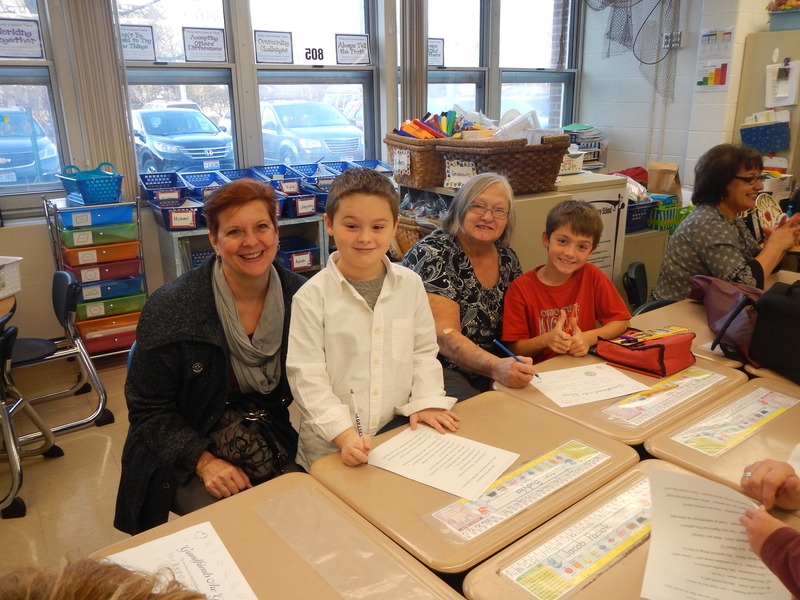 Grandparents of second grade students visited Falls-Lenox December 7th and 9th for Silver Linings Day. Children and their grandparents completed a writing activity and read a story together in the classroom. It was a great morning on both days and we would like to thank all the grandparents who came out to visit their grandchild and support their education at Falls-Lenox! Some Olmsted Falls High School vocal and band students took their talents outside their building to other schools in the district. They sang and played holiday music to our students in other schools. View photos of their performances at various schools by clicking HERE. They also surprised holiday shoppers at Great Northern with a flash mob rendition of Carol of the Bells. To view a photo gallery of this event, click HERE. 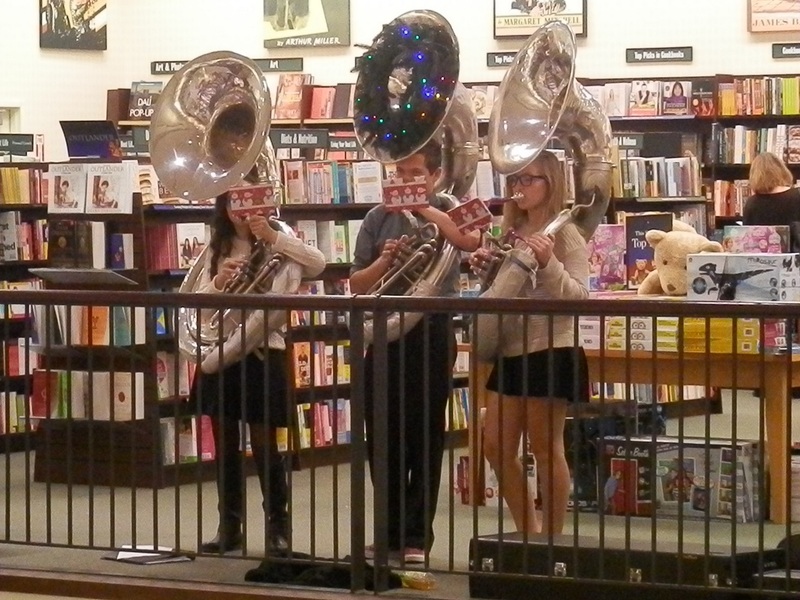 Traveling to Crocker Park, music students also serenaded visitors at Barnes and Noble. To view photos of this performance, click HERE. The OFMS Golden Harmonies also made the rounds throughout the community. Members serenaded those attending the Olmsted Falls and Olmsted Township tree lighting ceremonies, the Grand Pacific Junction Christmas Open House and performed at SouthPark Mall. They also carolled at various local assisted living/retirement homes, including Kemper House, Village of the Falls, Renaissance, Emerald Village, Brookdale and the Orchards. To view their photo gallery, click HERE. 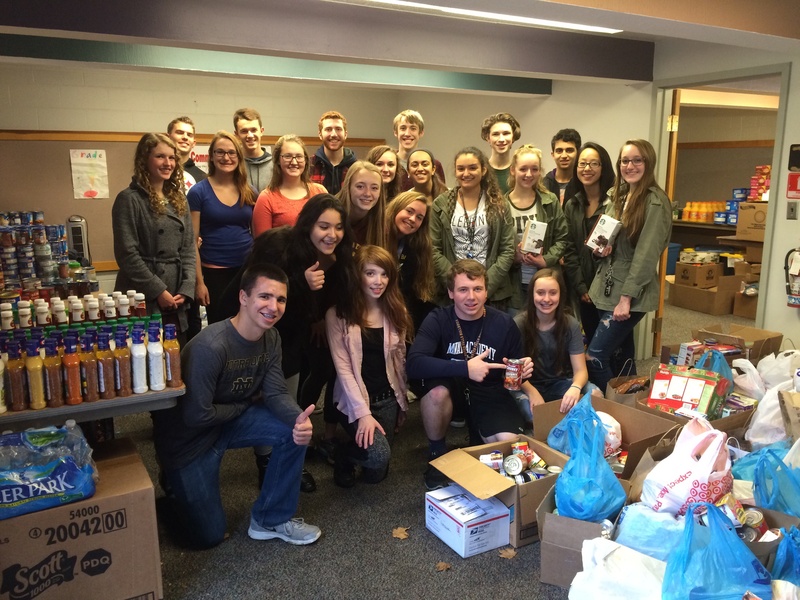 A thank you to all who supported and promoted this year’s OFHS Student Council Food Drive! We wound up with 5,131 items–BREAKING THE SCHOOL RECORD of 5,010 items in 2011–all of which will help needy families in the Olmsted Falls/Township communities! We are now at a ten-year total of 22,153 food items. A special thanks to Sean Pellerite, winning classes for the 5th time in 7 years; Justin Zrenner, runner-up classes; Jenelle Hughes, third place and the entire library, custodial and housekeeping staffs for helping us store this food for the last 11 days and providing boxes to move the items more easily. Those in this photo moved all 5,000+ items from the Media Center to the Food Pantry at the former Olmsted Falls Library building on Main Street. They also composed the bulk of our organization spearheading this initiative, with the poor Linder boys who were charged with counting and moving all of Sean’s food. Just a tremendous effort from all. Thank you. Happy Holidays! ECC had a wonderful turnout of those providing items to its hat, mitten, and sock tree. The items will be donated to Applewood Center, a local nonprofit agency committed to improving the lives of children by providing high quality behavioral healthcare and out-of-home services. 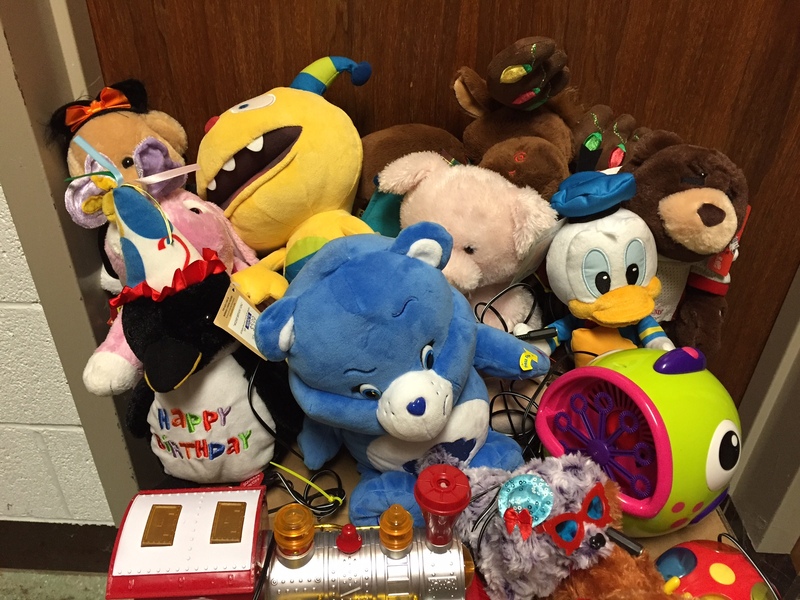 More than 500 toys were collected through the OFIS Student Council this giving season. Shown here are three council members and their moms who helped transport the donations to the Toys for Tots warehouse in Middleburg Heights. They also helped Toys for Tots personnel sort the items that were locally donated. The ECC kindergartners continue to view their version of Pumpkin Jack, which stands, well, leans, in an exterior planter outside the school. They are learning that their version truly follows the Pumpkin Jack book, which follows the life cycle of the large squash throughout the various seasons. Wonder what will be left of him when they return from winter break? 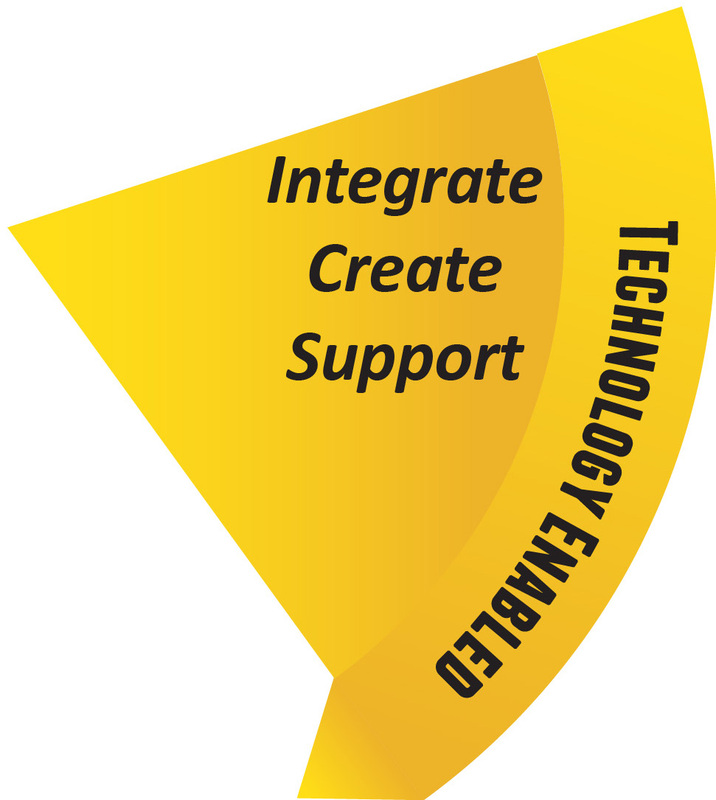 As the integration of technology into education continues, Olmsted Falls School District is providing a series of Technology Information invites for parents to learn more about the various tools being used to enhance student learning and success in our classrooms. The second of four scheduled sessions was held earlier this month and covered the topic of Educational Websites for Students & Accessing Resources Provided by Teachers. To review the information presented during this latest session, please click HERE. To download information presented during the first session, held in October, which covered Google Apps for Education, Compass Learning, PowerSchool and choosing the best device for your student, please click HERE. Technology Information Nights for Parents are presented by OFCS Technology Integration Specialists Dawn Carlin and Jeff VanArnhem. All Technology Information Nights are held in the Middle School Cafetorium from 7:30 – 9:00 p.m. These sessions are open to all parents/guardians of all OFCS students regardless of grade level. Devices will be available for use, but parents are also encouraged to bring their own laptop or mobile device, if available. To download official Technology Information Night flyer with detailed topic information, please click HERE. If you are attending Tri-C or CSU, please turn in your textbooks to Mrs. Curran in the high school library at the end of the semester. Do not turn in your books to the college bookstore. 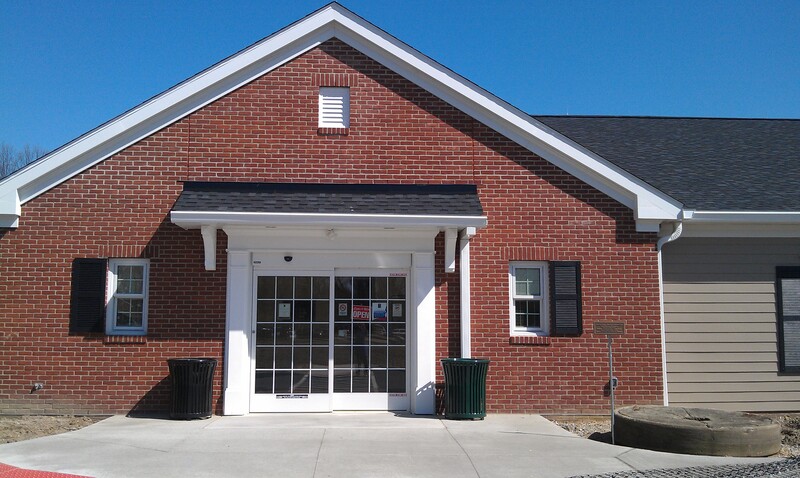 Falls-Lenox School will host a Red Cross Blood Drive from 3-7 p.m. January 11th in the Falls gym. 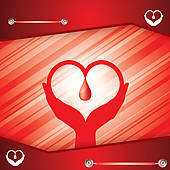 January is National Blood Drive month, which is a perfect time to resolve to be a regular blood donor. Students who have a parent, guardian or friend sign up to donate blood will receive a small prize. To view a flyer of the event click HERE and to see the top 10 reasons to donate blood, click HERE. 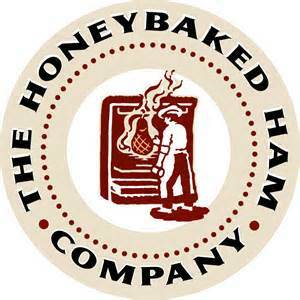 Thank you to those who placed orders with the OFHS Swim and Dive Team’s HoneyBaked Ham fundraiser. Please remember to pick up your orders between 5:30-7:30 p.m. Wednesday, December 23rd. Please enter the side band entrance of the Olmsted Falls High School building. Happy holidays. eds clean plastic lids from now until January 8th. The Green Team is accepting all colors and sizes of lids, which may be dropped off at the school or with a student you may know. Come join the Olmsted Falls Varsity Baseball program for a day of valuable baseball knowledge and fun. This one day skills camp will consist of fundamentals in hitting, fielding, throwing, pitching, catching, and base-running. Instructors will include the High School Coaching Staff, current players and former Bulldog players. If you have any questions, contact the Olmsted Community Center office at 440-427-1599 or email Office@olmstedcc.com. Deadline: December 15th guaranteed t-shirt and size availability. Late registrants will be accepted but t-shirt & size not guaranteed. 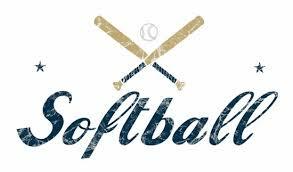 A January 18th fast pitch camp, which the Olmsted Falls coaching staff and varsity softball players will conduct, will prepare girls in grades 4-6 to hit the fields. It will cover the fundamental skills of proper base running, instructional hitting techniques, fielding, throwing, pitching and catching. It will run from 8-10:30 a.m. January 18th. The cost is $15. To sign up or learn more details, click HERE. The Bulldog Robotics Club is selling Dog Tag/Key chains in the Team Shop at OFHS and in the Snack Bar during home games. The $5 price helps support the teams. For more information, contact Mr. Haydn, mhaydn@ofcs.net. By popular demand, the Helping Hands 3E Love fundraiser is extended. Its second closing date is December 21th. Order any 3E Love merchandise online by December 21th and receive your items during Disability Awareness Week – January 11th-15th. Click HERE to see the flyer for order details or go to 3elove.com/ofcs. POST-PROM PARTNERS WITH ANGELINA’S PIZZA FOR TAKE-N-BAKE SALE! Olmsted Falls High School seniors will be celebrating the end of their four years of high school at their Post Prom on May 21, 2016. Please help us make this a lifelong memory as we ask for your support by simply ordering your family a pizza. The Olmsted Falls High School Post Prom Committee, a group of dedicated parents, is working hard to ensure a safe and secure place for the after prom party. Games, entertainment and food will be provided in a safe and substance-free environment at the Olmsted Falls High School. In order to make this night memorable, senior parents have numerous fundraisers. Here is your opportunity to help our class of 2016. Before you know it, you as a parent will be in our shoes with this wonderful fundraiser with our local Angelina’s Pizza. Celebrate our Take-n-Bake Pizza Sale!! Order your medium pizza for either a weekend lunch/dinner or a gift certificate good through 12/31/16. For the discounted price of $8, choose either a medium cheese take-n-bake pizza or a gift certificate for one for later. Keep in mind, gift certificates are perfect for those unexpected kids sleepovers! 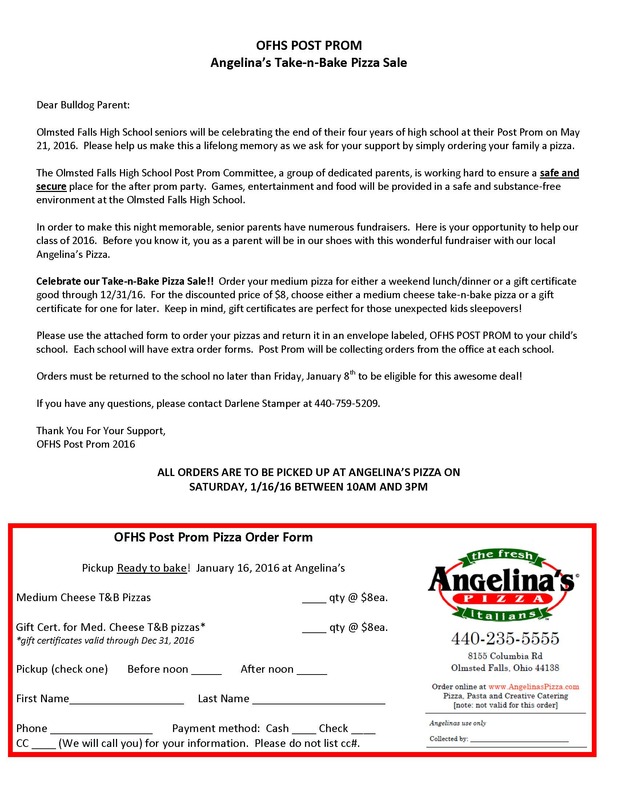 Please click HERE to download form to order your pizzas and return it in an envelope labeled, OFHS POST PROM to your child’s school. Each school will have extra order forms. Post Prom will be collecting orders from the office at each school. Orders must be returned to the school no later than Friday, January 8th to be eligible for this awesome deal! The planning has begun for the Class of 2016 Post Prom. The Food Committee set up a convenient way to donate perishable/non-perishable food items for the event as well as volunteering opportunities that will be assigned at a later date. To donate, go to www.perfectpotluck.com. Use FANARA as the meal plan name and its password: 2016. If you have any questions or would like to join the Food Committee, email Angela Fanara at amarysiak@hotmail.com. We cannot give our seniors an awesome Post Prom without your help. The musical “Music Man” is coming to town. Olmsted Falls Masquers and Forensics, together with Sky Zone, are raising money for this spring musical – Music Man. Discounted tickets are available to Sky Zone, the Westlake indoor trampoline park, which may be used anytime during the year. This is a great stocking stuffer that may be used on those cold days. Contact Jamie Wood for tickets at 216-406-2145 or jamiewood68@yahoo.com. Click HERE for an event flyer that also has an order form attached. Valentine’s Day is February 14th, but celebrate it just a bit earlier at the Post Prom Fundraiser on February 13th. The 6-8:30 p.m. event at Molly McGhee’s Sports Pub includes pizza, wings, rigatoni, salad and all types of refreshments. It also offers a 50/50 raffle, barrel of cheer raffle, basket raffles and auction items. The cost is $25. Tickets are going fast so get yours today. Contact Lisa Ciehanoski, 440-781-2511 or JLCIEHANOSKI@sbcglobal.net. Olmsted Falls City School District provides educational experiences that empower our future graduates to become life-long learners who have explored career pathways of their interest so that they can succeed as a citizen in a global society. 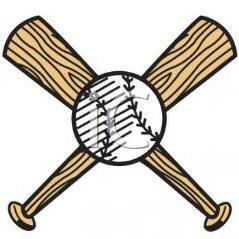 Players ages 6-14 may now register in Olmsted Travel Baseball Association’s (OTBA) Lorain County Hot Stove League. Sign up deadline is January 2nd. To read more information about the league and registration, click HERE. This league is for players who typically have a higher degree of talent than players participating in a community recreational league. Although players do not have to try out for teams, the time commitment necessary is higher than that in community recreational baseball. Teams will play games at fields up to 45 minutes away. Teams may also decide to participate in fundraising activities. The season begins around May 1 and ends about mid-July. One hour before The Nutcracker show times TOMORROW – SATURDAY – we invite you to join us for the Sugar Plum Fair. Vendors from all over Northeast Ohio will enchant you with sweets and gifts for the whole family. View the shops and take in the Christmastime ambiance before the ballet begins. 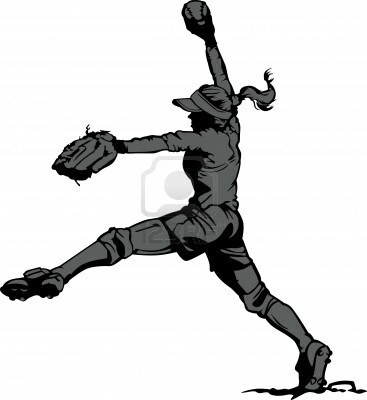 Registration for the upcoming 2016 Olmsted Girls Fast Pitch Softball Association is now open through December 24th. Girls living within the OF school district in grades 3-12 may participate. Teams play in U10, U12, U14 and U18 divisions. You may register online by clicking HERE or signing up in person by visiting the Olmsted Community Center through December 24th during normal business hours. Click HERE to view the association’s website that has detailed registration and league information. Tom Pettry is an OFHS ninth grader who was diagnosed with neuroendocrine cancer last month. 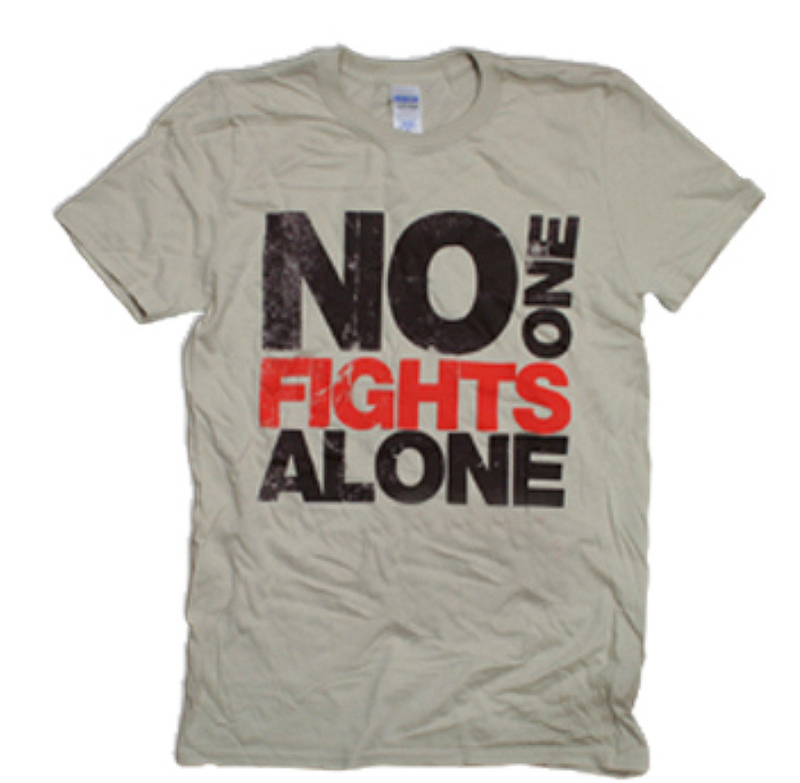 Purchase No One Fights Alone shirts to raise money for his family. They may be purchased for $15. Please send all orders to 9775 Tuttle Road, Olmsted Township. Before 2015 comes to an end, here is a reminder that the Olmsted Falls School District winter break is from Monday, December 21st through Friday, January 1. Next week is the last five days of school prior to winter break. are Julie Calaway, Abigail Clark, Emily Fidler, Miranda Gibel, Sarah Makari, Jeremy Monnolly, Julia Montgomery, Erika Ratcliff, Faith Topolski, Rachael Vance, Jonathan Wang, Collin Werner and Madison Zehe. 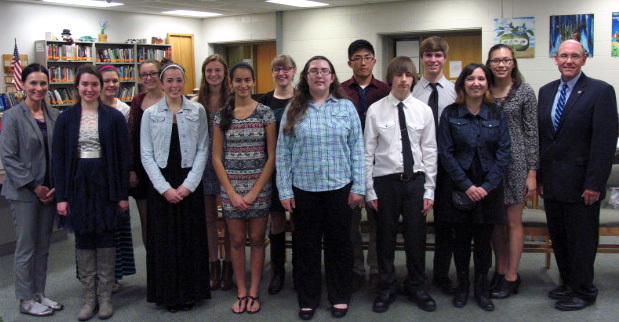 They were honored for their commitment, effort and excellence in the study of French. A 6th grade student, Evelyn Smits, was chosen as a Scholastic Kid Reporter for the 2015-2016 year. That means that Scholastic will give her a topic and she will write an article about it, in accord with their “News for Kids by Kids” program. The kid reporters will cover current events, breaking news, entertainment stories, and sports events from their hometowns and from around the world. Evelyn was one of just twenty-seven kids ages ten to fourteen throughout the United States who were chosen. A special job for the reporter is to cover the upcoming presidential election. If you have any questions for Evelyn, she would be happy to answer them. If you see Evelyn, please congratulate her on this accomplishment. To view her Scholastic Reporter Bio online, please click HERE. The OFHS wrestlers kicked off their season on a victorious note. They won 16 Team Findlay Duals Tournament Championship. They defeated Findlay Gold, 80-0; Newark Catholic, 82-0; Fairview Park, 72-3; Findlay Blue, 61-9 and the championship match vs. Napolean, 55-12. This is the third consecutive year the OFHS wrestlers won this tournament. The team will host the following events this season: Kiwanis Eric Emery JV Duals at 9 a.m. December 12th, Westlake Dual, 6 p.m. December 17th, Amherst/Berea Tri-meet, 6 p.m. January 28th and Padua/Perkins Tri-meet, 10 a.m. January 30th. Alison Doick, Olmsted Falls’ new behavior consultant was recognized by Superintendent Dr. Jim Lloyd for earning her ReThink Trainer certificate. With this added credential, Mrs. Doick is able to consult with teachers and school support staff regarding student behavior intervention and supports. ReThink is a social-emotional development curriculum. It offers staff development modules, behavior assessments and intervention strategies for staff working with students developing their social-emotional capacity. Alison Doick previously served in Olmsted Falls as an intervention specialist in the preschool moderate/intensive classroom and is a certified speech pathologist. 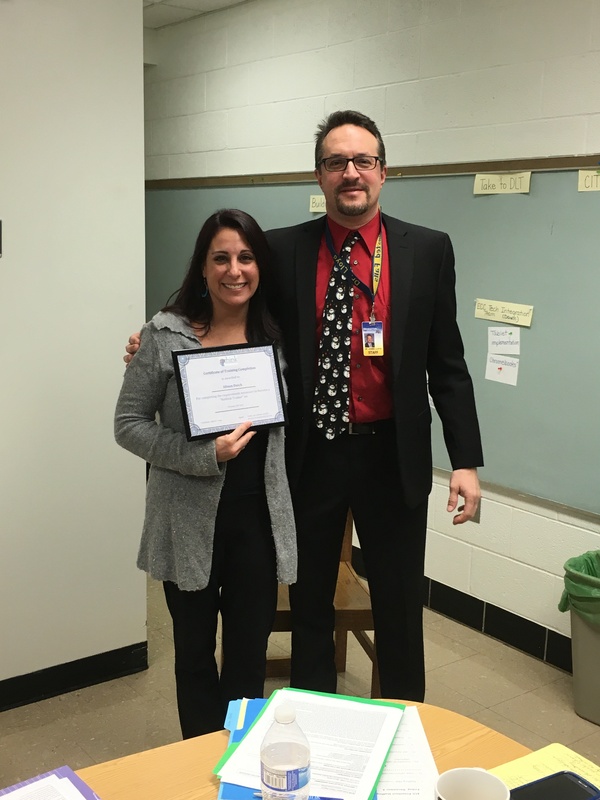 With her extensive experiences in behavior intervention for students with disabilities, Mrs. Doick is able to carry over similar strategies for students not yet identified. If parents are interested in learning more about her services, please contact your child’s teacher or guidance counselor. Olmsted Falls speech-language pathologists, Lori Kallevig and Lauren Holecko, collected over 25 adaptive toys at the RePlay giveaway event. These toys will be used across the district with students with disabilities who have limited mobility or language skills development. support language development and positive peer interactions. 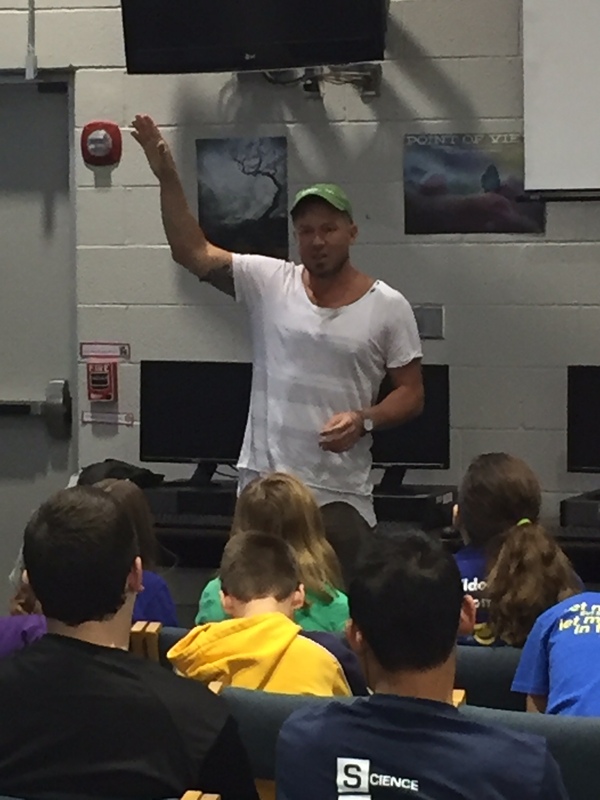 Olmsted Falls Middle school has partnered with RePlay to offer a workshop experience for 7th and 8th grade students in the new STEM program. In March the students will conduct a toy drive and then use collected toys to participate in a workshop to convert the standard toys into adaptive toys. This program aligns with the curriculum of this middle school course and supports RePlay with building their inventory for future give-away events. Olmsted Falls School District is so fortunate to have many local veterans participate in activities and events throughout the district. 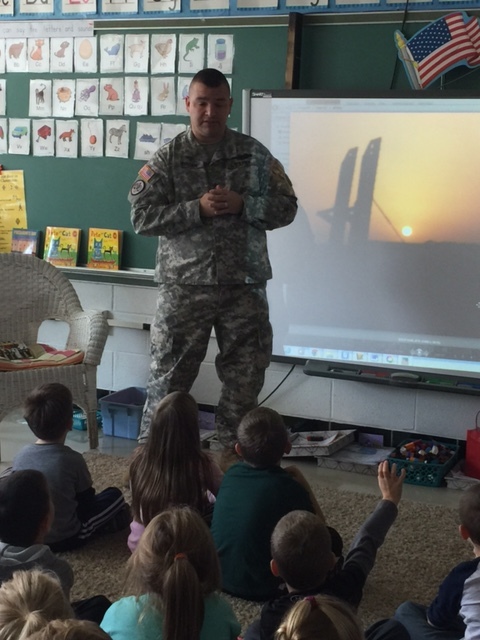 The Olmsted Falls Early Childhood Center extends its sincere thanks to Army Sergeant First Class Ken Walden, who visited Mrs. Roberto’s classroom on Veterans’ Day. Many musical events are planned in our schools this month. There also are several programs in January and the popular Super Bowl Hoagie Sale Feb. 6. Congratulations to our marching bands seniors and their parents who also are featured in the newsletter. To view the December issue of Musical Notes, click HERE. Deadline: December 15th to guarantee t-shirt and size availability. Late registrants will be accepted but t-shirt & size not guaranteed. Girls in grades 3-6 are invited to attend FREE the Softball Mini-Camp from 8:30-10 a.m. December 23rd in the OFHS auxiliary gym. This camp, which the Olmsted Falls coaching staff and varsity softball players are hosting, will cover fundamental instructional hitting techniques. It is a morning filled with softball knowledge and fun. Deadline to register is December 17th. To see a more detailed flyer and sign up form, click HERE. OFIS students are working on a big project that needs clean plastic lids from now until January 8th. REMINDER: OFIS FUNDRAISER PICK-UP IS TODAY, DEC. 11TH FROM 3-7 PM! The OFIS PTA Charleston Wrap fundraiser pick-up is scheduled for this Friday, December 11th, from 3pm-7pm in the OFIS cafeteria. Please be sure to stop by to pick up your items! Thank you so much for your support!! Any questions, please contact kristiepatton@cox.net. Barnes & Noble is hosting a Book Fair for Olmsted Falls schools this Friday, December 11th at its Crocker Park location. Story hour times are at 10 and 11 a.m. and noon. Enjoy art displays, evening performances by our schools choirs and bands and other amenities. To view a detailed flyer of the event and instructions in ordering books if unable to attend that day, click HERE. OFHS Masquers and Speech & Debate Team invite all to dine at Max and Erma’s December 11th at its Westlake location. The group will receive funds from items purchased there throughout the day when presenting a flyer, which can be downloaded by clicking HERE. Who doesn’t like Cheesecake Factory’s desserts? The OFHS Junior Class gives you the chance to take some home with its Barnes & Noble Booksellers’ fundraiser featuring cheese cakes and cupcakes from Cheesecake Factory. Order forms must be brought to the OFHS main office by December 11th! You decide when to pick them up at Crocker Park’s Barnes & Noble Booksellers location. To download an order form with complete instructions, click HERE. Need some Bulldog apparel? The OF Athletic Boosters’ Christmas apparel sale is from 9 a.m. to 1 p.m. Saturday, December 12th. Items range in sizes from newborn to 3XL. Special orders can accommodate any item or size that is not in stock. The sale includes special stocking stuffers, tervis tumblers, socks, hats (both ball caps and stocking caps), jewelry, hoodies, crews, long/short sleeve T-shirts, sweatpants, jackets, stadium chairs and lots of unique items. Cheerleaders, who will accept donations, will be available to wrap your items. The OFSD Transportation Department has a “Stuff the Bus” food drive from 9 a.m. to 1 p.m. December 12th in the Board of Education parking lot. All donations/collections will be donated to the local Food Pantry for families in need. As Falls-Lenox/ECC PTA begins preparing for our annual Holiday Staff Appreciation Luncheons at ECC and Falls-Lenox, they are reaching out to parents for donations to help make these events a success. F-L/ECC PTA will be collecting donations in the form of door prizes (gift cards $5-$20 or a small gift item) to be given to our hard-working teachers and staff, beverages (2L bottles of pop or cases of bottled water), and desserts. Flyers were sent home with students last week. 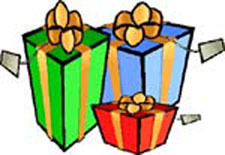 FL-ECC PTA asks that all door prize donations are dropped off at either ECC or Falls-Lenox by Monday, December 14. Beverage and/or dessert donations will need to be dropped off by 9:00am at your school on the day of the event (ECC 12/17; Falls-Lenox 12/18). If you plan on donating a door prize, beverage or dessert, please email Chrissy Ferrone – ECC (chrissyferrone@gmail.com) or Katie Pasiak – Falls-Lenox (connellke@yahoo.com). Your generosity is greatly appreciated! 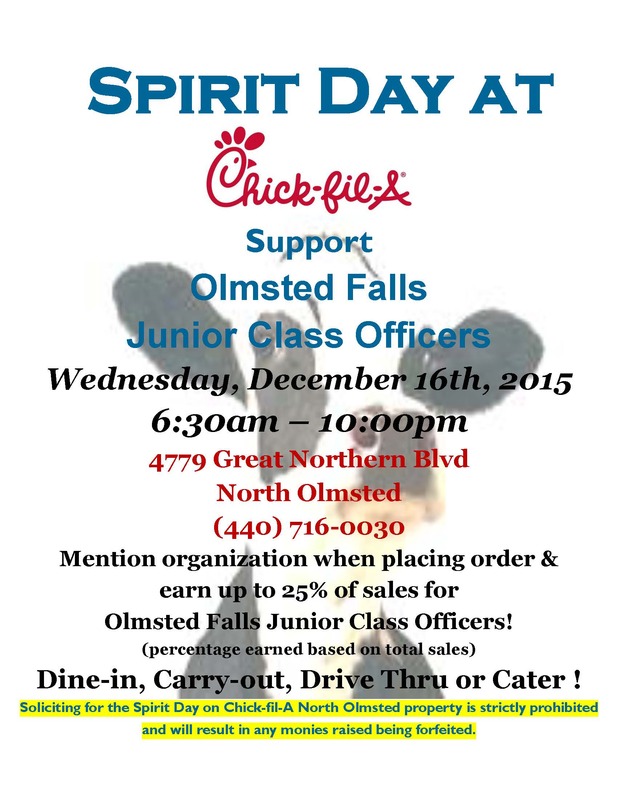 The OFHS Junior Class Officers are participating in a Spirit Day Fundraiser at Chick-Fil-A in North Olmsted next Wednesday, December 16th. 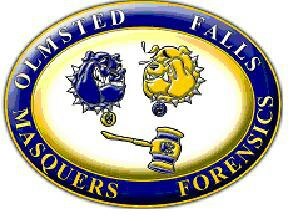 Mention OFHS Junior Class Officers when placing order & earn up to 25% of sales for Olmsted Falls Junior Class Officers! To download the event flyer, please click HERE. STILL TIME TO ORDER YOUR POINSETTIAS FROM NATIONAL HONOR SOCIETY – DEADLINE DEC. 16TH! Who doesn’t like poinsettias at Christmas time. The OFHS National Honor Society again has its Poinsettia Sale now through December 16th. Sizes and prices are $5 for 4-inch plant; $7 for 6-inch; $11 for an 8-inch florist pot and $15 for a 10-inch plant. Color selections are red, pink and white. Place your order using the order form that is viewed by clicking HERE. 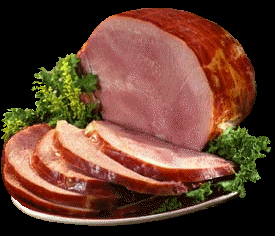 From now until December 17th, the OFHS Bulldogs Swim and Dive Team offers you the chance again to order delicious HoneyBaked Ham or glazed roasted and smoked turkey breasts and gift certificates for your holiday entertaining. Certificates may be used as gifts or use them yourself throughout the year at the store. Use the online option by clicking HERE or download the form HERE. Deadline to order is December 17th. By popular demand, the Helping Hands 3E Love fundraiser is extended. Its second closing date is December 20th. Order any 3E Love merchandise online by December 20th and receive your items by January 6th – in time for OFCS Disability Awareness Week, which is in that month. As an FYI – Stearns Road between Cook Road and Bagley Road will move to a southbound only traffic pattern beginning on Monday, December 14th. This will likely stay in effect until the Fall of 2016. The posted northbound alternative is Lewis Road. Public Works is planning on having deputies from the Cuyahoga County Sheriff’s Office at both the intersections of Stearns/Bagley and Fitch/Bagley during the morning rush both next week (12/14 – 12/18) and during the first week back to school following the break (1/4 – 1/6ish) in order to maintain traffic and help patterns settle into place. They are very aware of the potential for congestion and will do their best to tweak things in order to keep traffic moving through Bagley, specifically in the mornings. Monday morning (12/14) will be a “soft closure” and likely won’t take place until after the morning rush hour is complete. Please click HERE for further details from the Cuyahoga County Department of Public Works. The Nutcracker Ballet – At 2 p.m. this Saturday, December 12th, enjoy segments of the Nutcracker Ballet that the Cassara Dance & Theater will perform, with Nutcracker stories in between dances. The dance troupe will also teach some basic ballet dance moves to attendees. We’ll also have a Nutcracker ornament craft to make and take home. The program is for ages 4-11. Then, on Wednesday, December 16th, don’t miss the Holiday Cookie War event! 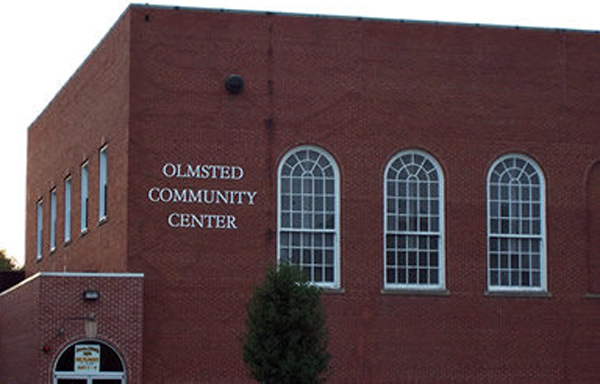 Olmsted Recreation offers many activities at Olmsted Community Center for seniors. 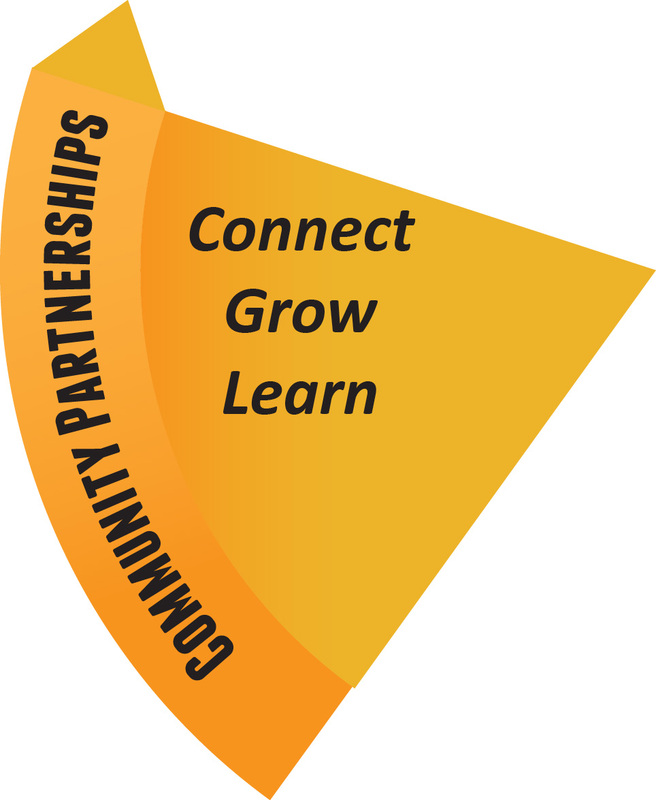 To view a December activity calendar, click HERE. It is sponsoring a Christmas Party December 18th with a December 15th deadline sign up. To view a flyer, click HERE. Last week, the day before Thanksgiving, the Ohio Department of Education released to the public the preliminary test scores for school districts across the state of Ohio. These long-awaited scores report student knowledge and skills as measured by the new state assessments taken by students last spring. As a reminder, students across the state of Ohio took new state assessments in English Language Arts and Mathematics known as PARCC tests. They also took state assessments in Social Studies and Science known as AIR tests. In spite of the numerous technological glitches experienced during the testing and a high number of student opt- outs, Olmsted Falls School District demonstrated continued success with all scores falling well above the state indicators. We are incredibly proud of our students and commend our outstanding teachers who continue to do what they do best – teach! While test scores alone do not define our District, these results show that what we do every day in the classroom continues to translate into student learning. Moreover, Ohio’s Learning Standards now place greater emphasis on critical thinking, problem solving and writing and the PARCC and AIR tests were designed to measure these skills at a deeper level than ever before. While many districts braced for significant dips in achievement test scores, Olmsted Falls remained confident that our students and staff would continue to demonstrate success. * NOTE: The “Percent Needed to Meet State Indicator” column is the percent of students passing that a school district needs in order to meet the state indicators. Olmsted Falls School District was well above the percentage needed to meet all State indicators. 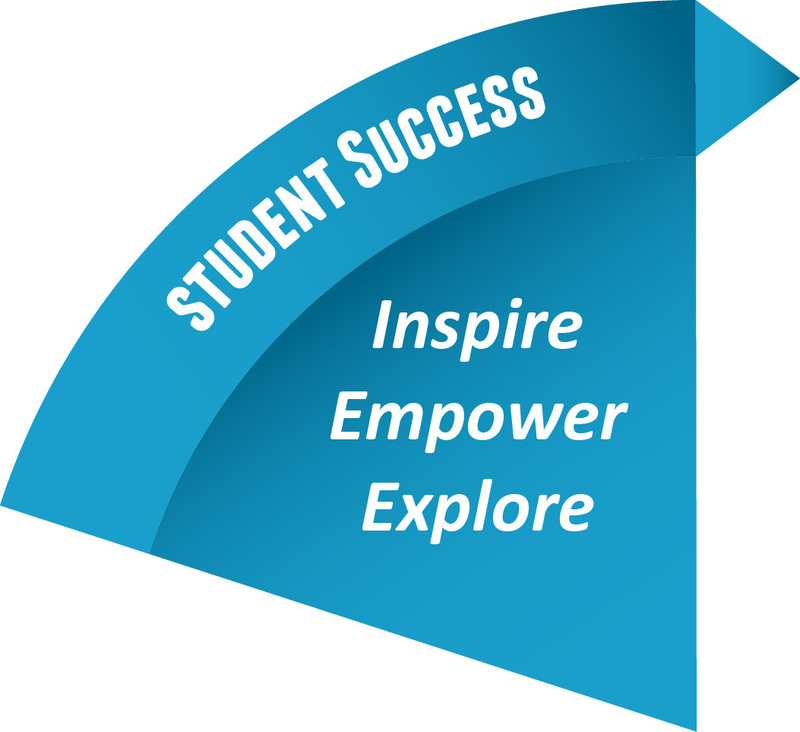 Individual student score reports will be sent home to parents in backpacks for students in grades 3 to 5. Parents of students in grades 6 to 8 will receive the individual reports via mail. Parents of high school students should have already received their individual student score reports. Any parents with questions or concerns about individual student, grade-level, or district-level test scores are invited and encouraged to contact your child’s teacher, building principal or Assistant Superintendent Kelli Cogan. The Golden Harmonies represented Olmsted Falls Middle School well as the group performed a collection of holiday music for guests gathered to celebrate the Olmsted Township Tree Lighting Ceremony last weekend. Kudos to these talented students for helping spread holiday cheer! Great job! 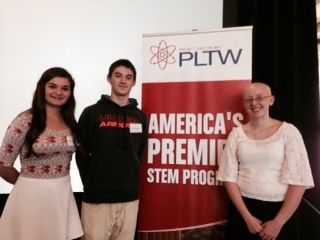 Three pre-engineering students attended the Ohio PLTW – Project Lead The Way – Conference at Sinclair College in Dayton recently. They demonstrated the use of the Intelitek Scorbot Robot and the VEX Robots they used at National SkillsUSA Competition in Louisville, KY in June. Teachers, administrators and counselors in Ohio schools that use the PLTW pre-engineering and biomedical curriculums attended the conference. The three presenting students were Joselyn Rabbitt, Logan Klink and Stephanie Schroth. OFHS is a certified PLTW “School of Excellence.” These students are the reason why. Second grade teacher Mrs. Karen Megery and six of her students made a special presentation to the Olmsted Falls Board of Education during their regular monthly meeting in November. Each student assisted with a different part of the presentation which highlighted their second grade Google classroom and all of the great new tools they have been using this school year. The kids did a great job sharing their learning experiences with Board members and visitors in attendance at the Nov. 12th meeting. MRS. MEGERY’S 2ND GRADE CLASS MAKES TOP 20 IN CURIOUS CLASSROOM CONTEST! A BIG thank you to all who took time to vote – many of you daily – throughout the month of November for the video entry submitted to the Houghton Mifflin Harcourt Curious Classroom Contest by Mrs. Mergery’s 2ndgrade class. Mrs. Megery has just received notice that their video has made it in to the Top 20 finalists! Mrs. Megery and her students are extremely appreciative to everyone who took time out of their busy schedules to cast votes for them. Their video entry now moves on to the final judging phase. Winners will be announced early next year. A new SMART Board, a classroom set of Chromebooks, and a collection of books for the school are among the top prizes! Thank you again to everyone who helped move their entry on to the next level! ending child hunger a national priority. speak to our L.E.A.D organizations to promote the fundraiser. Students were encouraged to donate $1 to wear pajamas to school November 24th. The grand total raised was $491. To view a photo gallery of his visit, click HERE. Reports of the many Veterans day events and activities continue to come in and we’d like to share them with you. Kudos to our Bulldog staff members and students for the wide variety of special events and activities that took place across the District in honor of Veteran’s Day! in honoring our nation’s veterans. 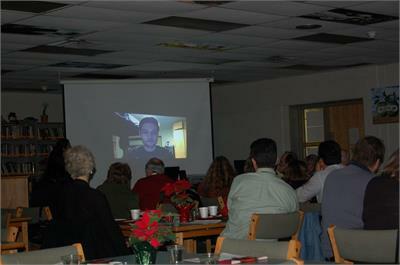 Students were divided into groups and had the opportunity to listen to and participate in one of three presentations. 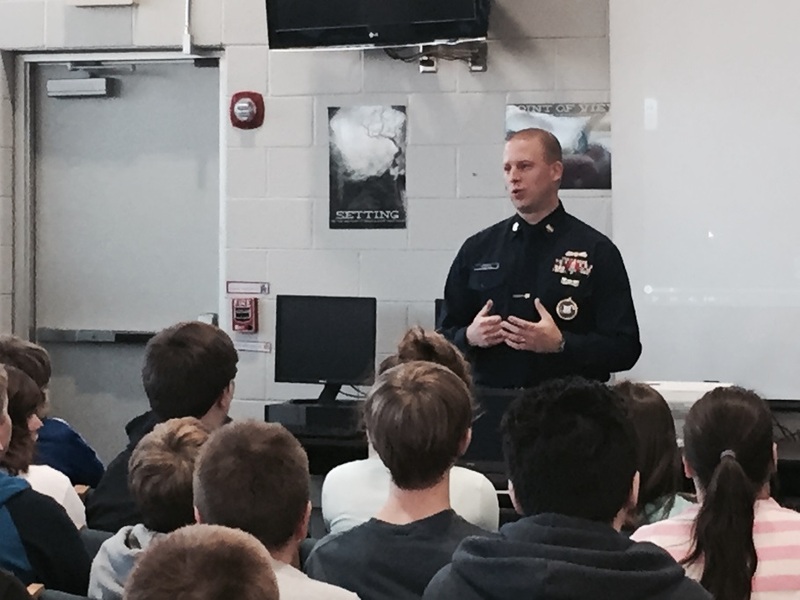 Guest speakers were Petty Officer Kevin Morron, a Coast Guard recruiter; Commander Mark Bobal, a retired Coast Guard commander, and Major Fox, a retired U.S. Army Reservist. Students listened to their stories, participated in mini-simulations and learned how the military could be a career option. Falls-Lenox received some kind words of appreciation from a guest who attended the school’s annual Veteran’s Day breakfast event. Anne Cole, a retired Berea school teacher who now teaches at Baldwin Wallace University, took the time to send an appreciative note to the students and staff at Falls-Lenox. Anne, who was Ohio’s 1996 Teacher of the Year, is the mother of Middle School social studies teacher Dan Largent and she attends the event with Dan’s grandfather. To view her special thank you note, click HERE. We are so proud of so proud of Falls-Lenox – and our other buildings throughout the District – for truly touching people lives with these special events and activities. Chromebooks to investigate tangrams and also figuring out how much food is needed for different amounts of guests at a Thanksgiving dinner using ratio tables. Whew! After this, came the task of creating a Thanksgiving feast for 15 people on a budget of $100. 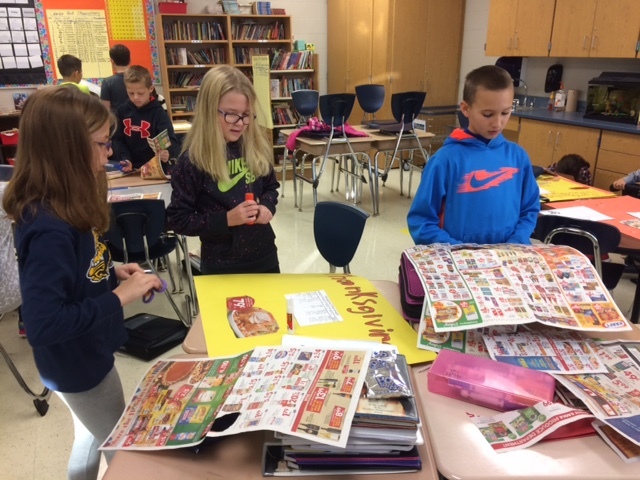 Students used local grocery store flyers to choose the best deals, calculate the total cost of the meal and the cost per guest. We know the children have a much better appreciation of what their families go through to get the big meal together! To view a photo gallery of students at work on this project, click HERE. 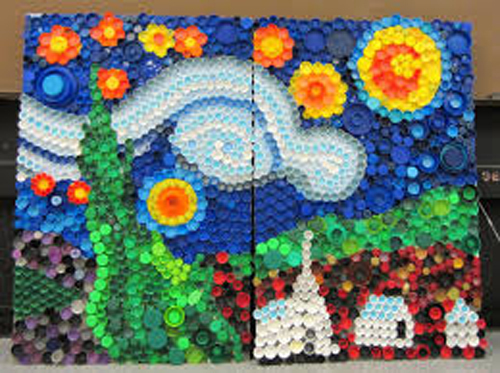 OFIS students are working on a big project that needs clean plastic lids from now until January 8th. The Green Team is accepting all colors and sizes of lids, which may be dropped off at the school or with a student you may know. Richard Rivera, Connor Hughes and Logan Klink. The Robot season, however, is not over. There are still competitions coming this spring. chains in the Team Shop at OFHS and in the Snack Bar during home games. The $5 price helps support the teams. For more information, contact Mr. Haydn, mhaydn@ofcs.net. Bulldog grad Mike Gansey, right, with his former OF basketball Coach Pat Donahue. OFHS grad Mike Gansey recently was named the general manager of the Canton Charge, which is the Cleveland Cavs NBA franchise developmental league team. To view an article about his latest career move, click HERE. Mike, who as a senior, averaged 27.2 points, 10.5. rebounds, 3.2 assists, 3.3 steal and 1.6 blocked shots per game, led the Bulldogs to the Ohio Division II Sweet 16 and a 19-5 record. He was named 2000-01 Ohio Divisions II Player of the Year by the Associated Press and the Ohio High School Basketball Coaches Association, finishing second in Mr. Basketball voting behind LeBron James. He is in the OFHS Athletic Hall of Fame. He has an illustrious basketball career at the University at West Virginia, played in the NBA D-League and professionally overseas before joining the Cleveland Cavs in various off-the-court positions. 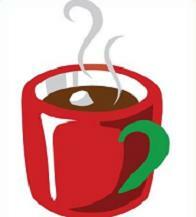 OFHS will have its annual Cocoa and Cram event at 2:20 p.m. Thursday, December 10th in the cafeteria. Student Ambassadors will guide study sessions and provide testing tips to help this year’s freshmen prepare for their first midterms. Student Ambassadors will invite our ninth graders to the event in homerooms. Please contact Ms. Peterson, ninth-grade counselor, for more questions. OFIS FUNDRAISER PICK-UP IS DECEMBER 11TH FROM 3-7 PM! The OFIS PTA Charleston Wrap fundraiser pick-up is scheduled for Friday, December 11th, from 3pm-7pm in the OFIS cafeteria. 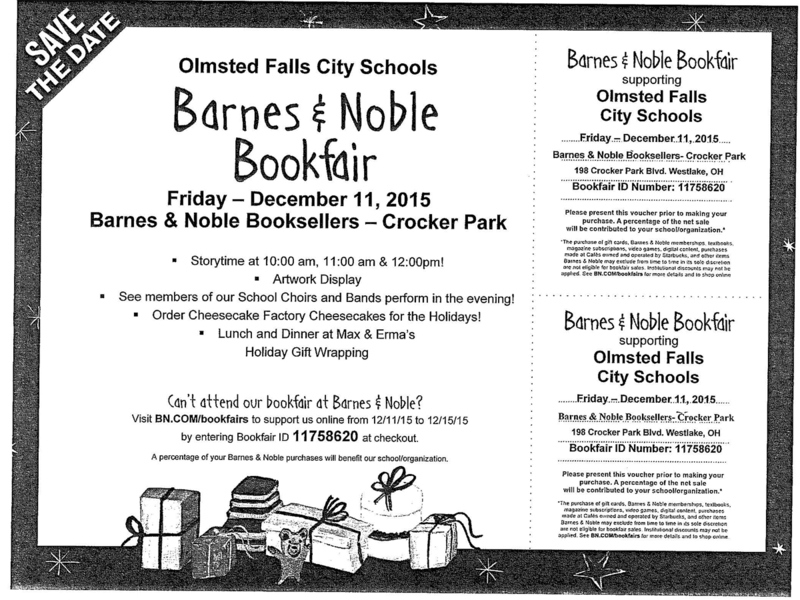 Barnes & Noble is hosting a Book Fair for Olmsted Falls schools Friday, December 11th at its Crocker Park location. Story hour times are at 10 and 11 a.m. and noon. Enjoy art displays, evening performances by our schools choirs and bands and other amenities. To view a detailed flyer of the event and instructions in ordering books if unable to attend that day, click HERE. As an FYI – Stearns Road between Cook Road and Bagley Road will move to a southbound only traffic pattern beginning on Monday, December 14th. This will likely stay in effect until the Fall of 2016. From 9 a.m. to 1 p.m. THIS SATURDAY, DECEMBER 5TH, Cub Scout Pack 102 will present Santa’s Secret Shop at Falls-Lenox Primary School. Kids may shop for holiday gifts for family and friends with the help of elves. Grownups may buy tickets for a holiday raffle of great items, including an Xbox One game system and Fitbit Flex activity tracker. Admission is free. All proceeds benefit Cub Scout Pack 102. Bring non-perishable food items between 9 a.m. and 5 p.m. this Saturday, December 5th, to the police cruiser parked at Shaker’s MarketPlace. 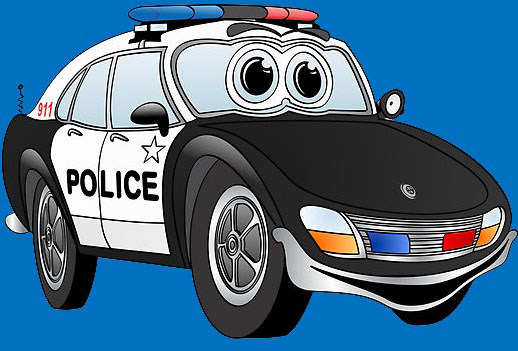 The Olmsted Falls and Olmsted Township police are sponsoring Stuff the Cruiser with items that will go to our Christians in Action food pantry. Monetary donations also will be accepted. Shaker’s offers some filled brown bags with needed items for $10 or busy such suggested items as peanut butter, cereal, juice boxes, dry pasta/rice, granola bars or canned meats, fish, soup and beans. To view a flyer of the event, click HERE. 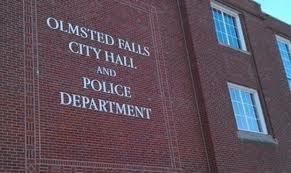 The city of Olmsted Falls will have a 5 p.m. Tree Lighting Ceremony THIS SUNDAY at City Hall. The OFMS Golden Harmonies will perform. Hot chocolate and cookies will be available. Prior to the tree lighting, the city will unveil Jenkins Place, the new senior center, at City Hall. People are invited to arrive at 3 p.m. for the 3:30 ribbon-cutting ceremony. The Nutcracker Ballet – At 2 p.m. Dec. 12th, enjoy segments of the Nutcracker Ballet that the Cassara Dance & Theater will perform, with Nutcracker stories in between dances. The dance troupe will also teach some basic ballet dance moves to attendees. We’ll also have a Nutcracker ornament craft to make and take home. The program is for ages 4-11. 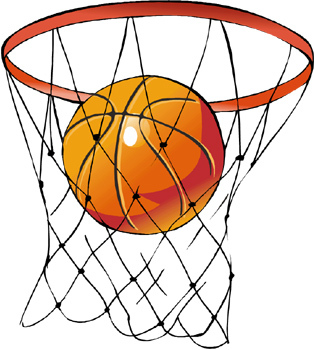 Boys in grades 7-9 are invited to join the Olmsted Community Center’s Travel Recreational Basketball League, which has teams from Berea, Brook Park, Middleburg Heights, Fairview Park, North Olmsted, Westlake, Rocky River and Columbia Station. Games will be played in these various communities. All boys who register will have equal playing time – there are no cuts. The league provides a chance to enjoy the game of basketball, emphasizing team play, the spirit of sportsmanship and fun. It runs from December through February 2016 with games on Saturdays. The one hour per week practices begin this month. Register online at Olmsted.com or by clicking HERE. To view the league’s flyer, click HERE.